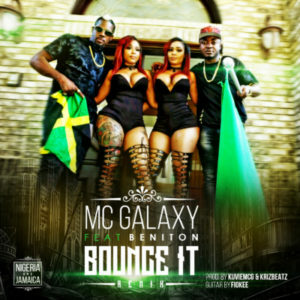 MCG entertainment head huncho MC Galaxy thrills fans with the remix to his track -“Bounce It”. The track which originally features Seyi Shay features Jamaican international reggae dance hall artiste Beniton. The club banger was produced by Mcg Empire’s first Ghanaian Producer Kuvie, co produced by the KrizBeatz and guitar by Fiokee.